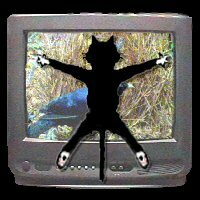 We watched a fascinating documentary on bower birds this weekend. Our cat, Maurice, found it fascinating, too. So fascinating, in fact, that he launched himself into a position like this: Alas, I have no photograpic evidence of this event. As it was, we could barely keep our spleens in from laughing as he ricocheted to the floor. There is a chance we could reenact it, however. How much is the prize on America's Funniest Home Videos up to? NB: Television, owners and feline have all recovered and are resting comfortably.